Of course, one of the significant hobbies that most people love doing is gardening. Am I right? You can plant flowering plants to vegetables to fruits to almost everything. But of course, apart from growing your garden into a bountiful one, do you have any plan of turning your garden into a beautiful one? If yes, why not consider some of the best options on how to decorate garden with waste material. Most of us would think that decorating things for the garden could be very expensive that sometimes we couldn’t afford at all. But, with recycled items, you will not need any costly material, like ​Christmas projector during Christmas season, to turn your garden into something you couldn’t imagine. Still no idea about what I am talking about? Well, you got to read this post until the end to know more. 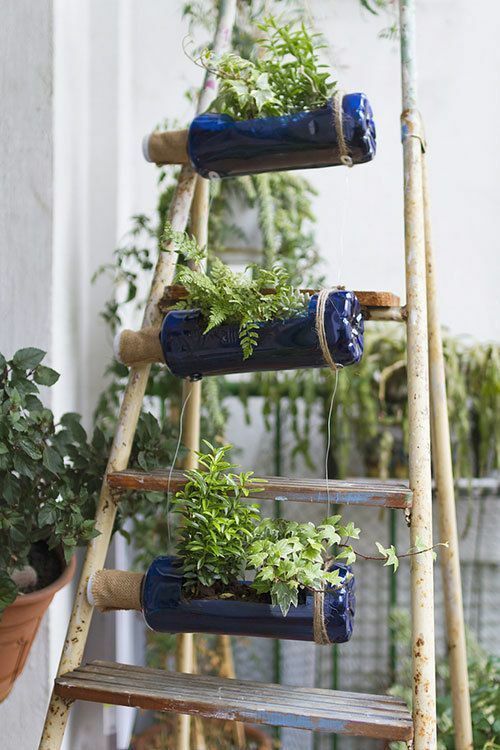 You could get the best out of waste ideas for the garden! 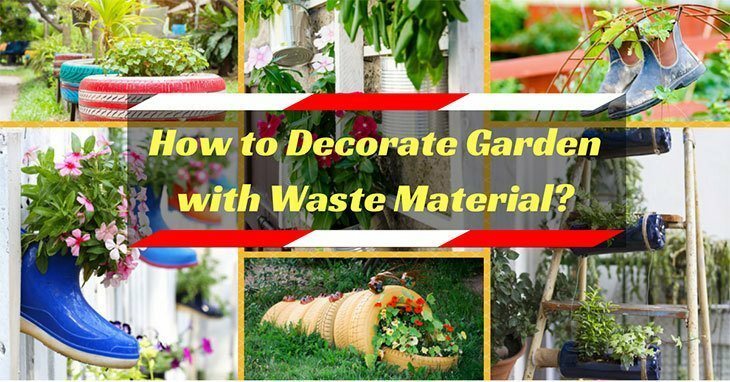 How to Decorate Garden with Waste Material? You might be one of those people out there that might be having a tough time decorating their garden, am I right? Perhaps, you think that you will spend a lot of time, effort and of course money just to make your garden a lot more creative and beautiful. However, don’t you know that there are other creative yet resourceful alternatives that you can try aside from having outdoor laser lights installed in your garden? Yes, you’ve heard it right! Garden decoration ideas DIY are excellent alternatives by those with creative minds. Do you have regular metal cans that aren’t used at all? Get them and reuse them in decorating the garden. And one excellent thing to consider is to convert these items into fun planters up to hold plants or flowers. What to do? Well, the process is so natural. First, you need to slice the base of the aluminium can to make sure that water could drain. This could be done with the use of a drill or even a nail and hammer. Next, you are now ready to turn the can into a planter. However, why not make it look a lot better? Consider painting it with lively colours or you can draw on it is using the garden as the inspiration such as leaves, flowers, bees and more. For those who aren’t great at drawing, you can buy stickers instead and stick them on the aluminium cans. You might as well leave them simple and plant flowers with different colours giving a cheerful touch to the garden. Indeed, this handmade garden decor could genuinely transform your garden. 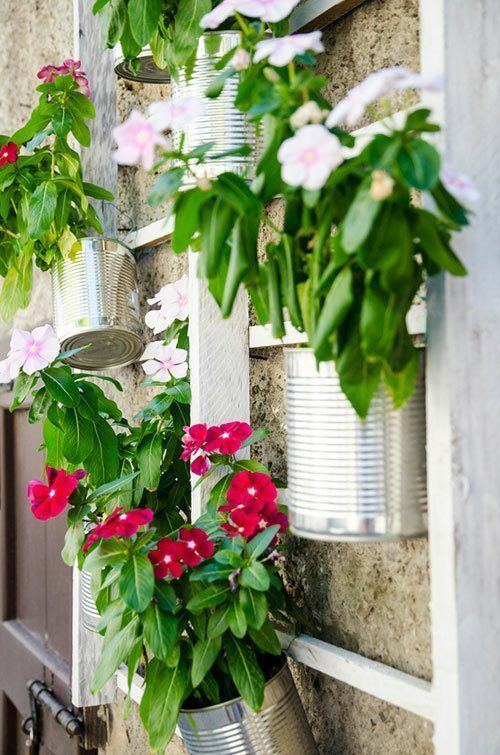 And another great idea is to make outdoor hanging lanterns having cans as for lighting up the garden during warm summer nights creating perfect atmosphere too. Another exciting way on how to decorate garden with waste material is to use pallets. They are often used to make recycled furniture like shelves, coffee tables and sofas. They are also optimal for use in the garden since the wooden structures fit in exterior decoration perfectly. You just need to bear in mind that the versatility of the said material makes it suitable for creating an outdoor couch, chair or table making your garden more beautiful. Maybe you know the fact that old tires can be used for almost many things wherein you only need to let your imagination run wild. 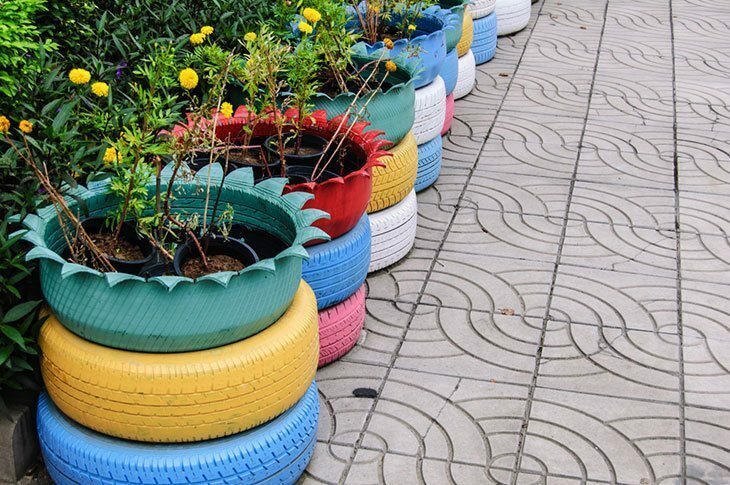 Old tires could be used as swings for the children, but in decorating the garden, you can use them to make flower pots that are covered with beautiful fabrics. 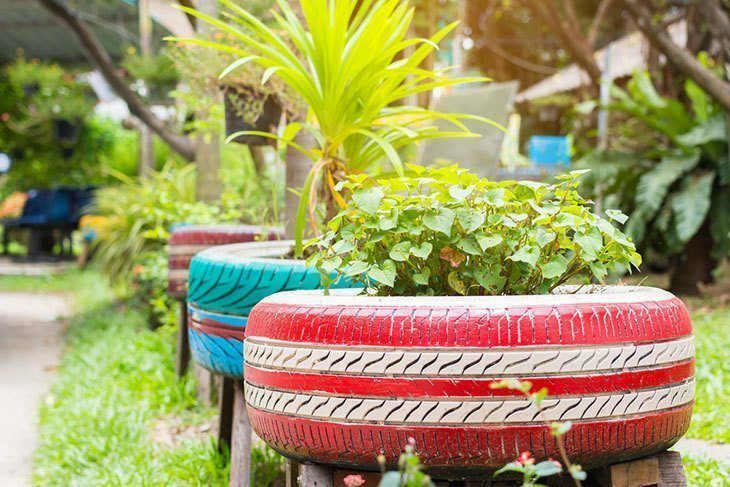 But for a tip, you can paint these old tires with distinct colours, or you can draw flowers, moon and more on them to give a more fun as well as cheerful touch to the garden. Explore more: How to put ribbon on a christmas tree? Best ideas you need to follow. Aiming for a vintage touch in your garden? Why not use those old ladders which are broken or those that are no longer stable? What to do with them? Well, you merely need to put them in the corner and utilise them like a shelf. You can fill the rungs with pots, old books, photographs or candles. This recycled object can provide the atmosphere like of a vintage decor, therefore, creating an old yet perfect intimate space for lovers of this style. For those with kids, I assumed you have many wellies lying around from when they were a lot younger. They usually have bright colours as well as fun designs that could never go out of style. 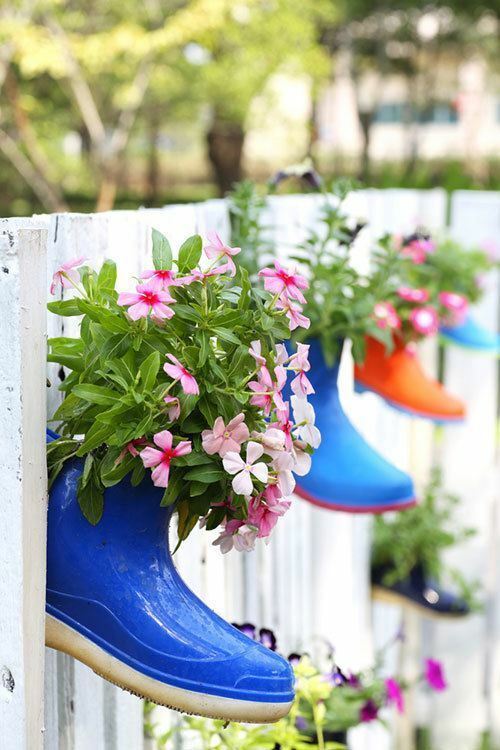 So, another great idea is to decorate your garden with the recycled wellies and make them into planters. As for filtering the water from the new planters, you must pierce the bottom of the boot, so they could adequately drain. Nevertheless, if you want not to break them, just fill them with dried plants which would give the garden a romantic touch. There you have it! Those are some of the most exciting ways that you can try as you decorate your garden with waste materials. You never thought about these ideas before, right? So, put them into reality now! You don’t need to worry about how to decorate garden with stones and other waste materials as this guide will help you throughout the process. You can also use log for planting purpose, and you only need to put your favourite plant in it. Recycling your garden carriers is a wonderful way to consider through making a decoration piece perfect to fit your garden. For those with old and damaged birdhouses, you can make it as a vertical decoration item in the garden. Making a sitting area could make the garden more beautiful. Place tables, chairs and decorate the space with birdhouses and flower pots. Creating an old duck with the use of old bottles will also enhance the beauty of the garden. You have this goal of making your garden more than just a space with plants or trees. Perhaps, making it a lot more attractive is what you aim to do. Good to know that with the ideas I have tackled earlier, you will not have to worry about fulfilling your goal. Those exciting ways on how to decorate garden with waste material will not just save your pocket form too many expenses, but it would also turn those waste materials, that you are supposed to throw, usable and beautiful. So, if you have waste items, at least have a second thought before tossing them, since you can still use them to decorate your garden. How about you? Do you have any unique ideas about decorating your garden with waste materials? Care to share it with us! Just leave your thoughts below, and we will be pleased to entertain them! Hit like and share this post with your friends and family too! Happy reading everyone! How To Keep Your Garden Look Beautiful: Simple Guidance For You!